Consider this one an unintentional early announcement. 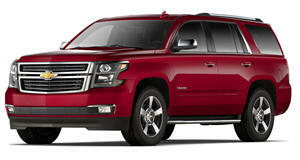 Just a few days ago, Chevrolet accidently released a press photo showing the tailgate of a 2015 Tahoe. Nothing special, really, except for one thing: there was a Z71 badge. Because of this mistake, Chevrolet has just officially announced that it will offer a Z71 package for the 2015 Tahoe and Suburban. No mention was made of what exact features will be included in this off-road package, but based on the Silverado Z71 trim, we’re likely to see bits such as an uprated, off-road suspension, all-terrain tires, and a locking rear-differential. Other unique appearance add-ons are likely. Remember, both the Tahoe and Suburban are true body-on-frame full-size SUVs – not some crossover SUV lookalikes (that’d be you, Ford Explorer). With the addition of the Z71 package, owners will be able to take even further advantage of the SUVs’ full off-road capabilities. Other updates coming to the 2015 Tahoe/Suburban include a hands-free liftgate and 4G wireless connectivity. An official announcement from Chevy will happen in the coming weeks.